The Prince and his wife Camilla visited the village of Mullaghmore as they continued their four day visit. PRINCE CHARLES SPOKE today of the personal loss he and his family experienced – as they learned of the IRA attack that killed his great-uncle, Lord Mountbatten. The heir to the British throne continued his four-day trip to Ireland – and this afternoon, made the key speech of the visit. 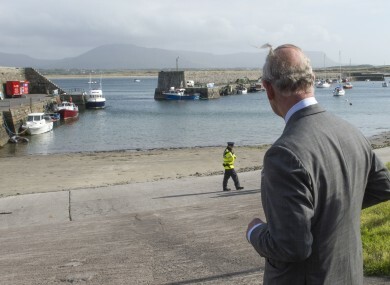 Later, the Prince and his wife Camilla visited the village of Mullaghmore – the site of the 1979 attack. “At the time I could not imagine how we would come to terms with the anguish of such a deep loss,” Charles told the audience at an event in Sligo town. “For me, Lord Mountbatton represented the grandfather I never had. So – it seemed as if the foundations of all we held dear in life had been torn apart irreparably. A bomb detonated on a fishing boat at Mullaghmore in August 1979 killed Mountbatten, his 14-year-old grandson Nicholas Knatchbulla, and a local teenager who worked for the royal – Paul Maxwell. Another member of his party – the Dowager Lady Brabourne – died the day after the attack. Lord Mountbatten had been a frequent visitor to the area in the years before the bombing – and was well known locally. The day of that attack – 27 August – is remembered as one of the darkest of the Troubles. Later, 18 British soldiers were killed as two bombs exploded in Co Down. After his opening his speech today with a few words As Gaeilge – the Prince spoke about the incredible progress that has been made in Anglo-Irish relations over the last number of decades. “We all have regrets about the past,” he said – before going on to quote the famous remarks of his mother Queen Elizabeth during her 2011 State Visit, when she said that, looking back “we can all see things which we would wish had been done differently - or not at all”. Prince Charles also met Gerry Adams yesterday – shaking hands with the Sinn Féin leader, in a moment that made headlines across the world. Charles and Camillaalso attended a peace and reconciliation service at Drumcliffe in Co Sligo later, in addition to visiting Mullaghmore. - With reporting by Michelle Hennessy. Email “"The grandfather I never had..." Prince Charles visits site of attack on Lord Mountbatten”. Feedback on “"The grandfather I never had..." Prince Charles visits site of attack on Lord Mountbatten”.